At Kubota Tractor Australia they believe the introduction of the new higher “speced” 95 horsepower M9540 Dual Speed tractor from Europe signals the beginning of a trend toward placing importance on specifications. Based on the very popular M40 Series range of tractors (62hp – 95hp), the new M9540 Dual Speed tractor is an exciting addition to the range. With its fully synchronized dual speed transmission, electric/hydraulic independent PTO, wet disc brakes and 4 wheel braking, the new Kubota M9540 Dual Speed tractor delivers high productivity with low running costs, making it ideal for a wide range of arable, livestock and mixed agricultural applications for farmers and contractors, as well as for other amenities and ground care uses. The four valve Kubota V3800 turbo engine is Tier 3 emission compliant for obvious environmental reasons. This high performance, low emission engine is efficient in delivering fuel economy while minimising noise and vibration levels. The new Dual Speed fully synchronized Kubota transmission offers a total of 36 forward and 36 reverse gears. Every gear including the integrated creep speeds can be split with the Dual Speed Hi/Lo half gear splitter. This offers a wide range of speeds for many applications. The forward/reverse shuttle is on the left hand steering column and allows clutchless operation, ideal for front end loader work. Top speed of the new M9540 Dual Speed is 40km/h. The tractor features electric over hydraulic engagement for PTO and 4WD. This results in smooth operation when engaging PTO driven implements and also allows 4WD engagement on the go. To maximise braking effectiveness, the M9540 Dual Speed tractor automatically engages 4WD when the brakes are applied during 2WD operation and the hydraulic wet type disc brakes retain efficiency even after repeated heavy duty work. 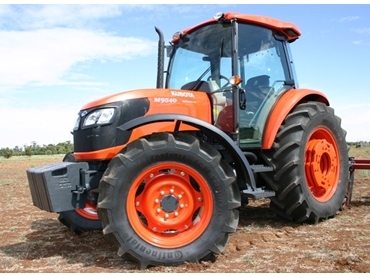 Kubota Tractor Australia also offers three different tyre combinations, including a vineyard tyre kit. The M9540 Dual Speed tractor has a lift capacity of 4100kg at the ball ends and a hydraulic pump flow of 64 litres per minute, and there is external linkage control for hooking up implements. Two hydraulic remote control valves are standard on the tractor. The 'Ultra Grand Cab' is ergonomically laid out with ample space, and was designed with the tall operator in mind. The air conditioning system is placed under the standard air seat, to allow for more head room. The dashboard layout, with digital LED panel, provides information about the tractor's performance and the one piece bonnet allows easy access to the engine compartment for maintenance. The Kubota USA manufactured LA1353E loader with its hydraulic self levelling system matches the new M9540 Dual Speed tractor well. The combination of the tractor’s tight turning bevel gear front axle, with the hydraulic forward/reverse shuttle and visibility to the bucket even in a fully raised position, make this machine an ideal front end loader tractor. The loaders can be fitted with a range of Kubota implements. A 3rd function valve and Kubota’s Shackles Ride Accumulator system are available as an option. The shockless ride absorbs the jolts when travelling over uneven surfaces, resulting in a smoother ride for the operator.